Remember Diane Keaton’s beautifully renovated Spanish Colonial? 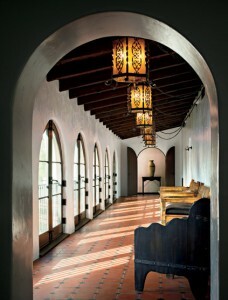 It was designed in 1927 by Ralph C. Flewelling and was featured in Architectural Digest a few years ago. Keaton sold it in 2010 to the Glee and American Horror Story creator Ryan Murphy. The Hollywood Reporter has a tour of it in their current issue, so let’s see how it looks now! Keaton’s designer Stephen Shadley came up with the idea for the inverted, upside-down shades in the kitchen that were so striking and memorable. Murphy says he liked how she had the house so much that he begged her to sell him all the furniture that came with it, but she declined. She did, however, let him spend a day photographing all of her things so he could replicate as much as possible. Of course I immediately had to look up photos of the sitcom’s sets and was thrilled to find an entire slideshow of them at NBC.com. You can see that they’re more colorful than his house–the kitchen looks a little more like it did when Keaton owned it. 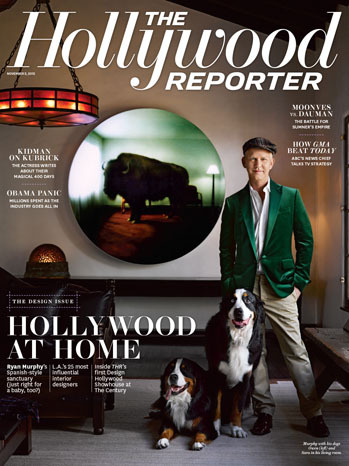 Check out The Hollywood Reporter’s first “Homes” issue to read the article and see the rest of the photos by Douglas Friedman. Inside Rayna's Country Music Mansion from "Nashville"
I am obsessed with this house. I have also just bought DK’s book California Romantica. I’m very partial to Spanish houses. Loved seeing how the house looks now. Thank you. Love this house. I also appreciate that Ryan is confident enough to keep elements that Diane used in the house. I didn’t know that library belonged to Diane, lovely house, love both decorations, however those shelves full of colorful pottery that Diane are what I liked most. 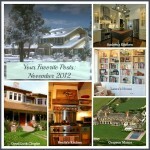 Gorgeous home – before and after. I love that he wanted to keep it exactly the same. That’s amazing. It’s not over crowded, but warm. It’s old and charming, yet has some updated elements. Very nice! Great post! And you worked American Horror Story back in. I COULD NOT keep track of which house we were in … but I loved it. I was totally distracted by Diane Keaton’s pottery. Bauer. I have purchased **ahem** a few pieces myself from time to time, but I love the idea of racking em and stacking em the way she did grouped by color. Pinning. Happy Thursday. I love this house, but even though he replicated many of Diane’s furnishings, it’s still a “man house”. I’m sure it suits him, which is what matters. This is how my husband would decorate if he was the one decorating at our house: no soft pillows, no color, no plants (although I’m wondering how much of Diane’s was the staging for the photo shoot, since it would be difficult to work around those massive cacti in the kitchen)! It looks great, but I preferred it with the warm colors and rustic finishes that it had when Diane lived there. My husband would prefer the one without decorative pillows, as he believes we have too many!! His bedroom actually looks like a picture from an old black and white movie to me. It’s a beautiful home, and it’s nice to see it with a new owner that obviously loves it! i am not familiar with this show, but i did enjoy it! i would like to see the bungalow that the main character on “grimm” lives in! Hi Julia, I love this post! Diane Keaton has fabulous taste. Seeing what the new owner has replicated, in his own way, is fun. Thanks for the details. I think it’s really adorable that he wanted to copy all of her furniture. I covet that kitchen. Great look, great collections and great tile work. The counter in the kitchen is a super way to use mismatched tiles from old tables. It’s NOT real tile!! There was an article (9/24) in the LA Times about this TV show’s set kitchen tile- they photocopied old tiles, the photos were printed onto fiberboard, then routed and sealed to look like real tile!! (The article stated using antique tile was too expensive) They also used “fake” Maynard Dixon paintings and damaged Bauer. Movie Magic!! And what a GREAT idea!!! Still love this house. Glad Ryan appreciates this home as much as Ms. Keaton did. His changes work for him and reflect his personality without dismissing the home. Well done, Mr. Murphy! I love the library! It is my favorite room of the whole house. Such a lovely post. I must say that I’m a little more partial to Diane’s more colorful taste. Although Ryan kept many elements the same, it seems more monochromatic and not as lived in. How lucky to be able to live in that home, huh? Hi Julia I also have DK’s book California Romantica I’m crazy about the Spanish architecture and you guys have some beauties. I like her style of decor in this home it’s more colourful but the Ryan has also done a great job. I love the kitchen and library. This was a lovely post thank you for sharing. Regards Esther from Sydney with crazy storms. Love this house in both incarnations. Diane Keaton is one of my favorite actresses and I admire her dedication to the preservation of 1920’s Spanish architecture. I love the way she used vintage pieces from the period and place that are in harmony with the original design. I also loved her Shaw’s Cove house in Laguna Beach, which is on the market now (you can Google it), but it doesn’t look much like the way it did when she owned it from what I can tell. (It was featured in the book “Vintage Cottages” by Molly Hyde English.) I wonder what her current house looks like? If it shows up in Architectural Digest, we’ll know it’s about to go on the market! Now I’m going to have to check out that TV show. The house used for the New Normal house is not the house you’re referring to. It’s a different house that was owned by Diane Keaton. That’s why the set and the house don’t look anything like each other in this article.